There are three major reasons why traditional SCADA software innovation has stagnated, but at the same time this presents new opportunities and provides competitive advantages to those willing to learn a little bit about IT technology. While the information technology (IT) world has made huge technological leaps in years past, the same can’t be said about traditional SCADA software. Only marginal technological advances have been made in this arena during the last 15 years. There are three aspects of traditional SCADA software that particularly impede any technological advance. All three can be remedied by blending SCADA functionality with IT technology and its standard protocols and practices. This article is designed to help companies understand why traditional SCADA software is holding most manufacturers back, and how to use modern technology practices to gain the competitive advantage. SCADA software was originally designed to control and monitor automated machinery. As such it performs the standard SCADA functionality for stop and start control, numeric entry fields for setpoints, animated graphics and simple trending. The leap to PCs was a huge advance in its day but nothing much has changed since the 1990s. It’s a little strange that newer IT advances haven’t much made their way into the industrial control realm. By blending SCADA functionality with web servers and relational databases it is possible to achieve better analysis, better reporting and better collaboration concerning every aspect of a company’s production. It is important to remember that software should not dictate a company’s business processes. Rather, software should be flexible enough to mimic a company’s existing best practices. These best practices represent, after all, actions taken by a company to be more efficient than its competitors. But equally important, software flexibility must be coupled with speed of application development to make it cost effective. IT uses relational databases and embraces a database-centric philosophy because it makes sense. This is how the rest of the world works and it’s time for the controls industry to wake-up and smell the roses. Many great ideas come and go because implementing them is not cost effective. You’ve heard of jumping through hoops to bend software into the desired form. You’ve also heard that installing software could alone take days or weeks—software that has to ship on DVDs is probably just bloatware. Even worse, creating applications is frustrating because dealing with relational data is impossible with most systems without doing some serious hacking. It is imperative that SCADA software in today’s competitive market be designed with a web-based, or central server, architecture—just like IT does it. IT approaches installations, development and system maintenance via a central server architecture model. This means for any task that IT performs on the system, they do it once and move on to the next project. Software is installed once, projects are developed once, and changes or updates are made once, and every client machine can instantly launch the latest functionality. Using SCADA software that is designed around the web-based concept borrowed from IT can drastically change the role of the engineer or integrator from “implementation specialist” to “innovation specialist” which can greatly increase a company’s competitive advantage. There is one other very large roadblock to SCADA advancement: how software is licensed. Most SCADA software vendors charge users by how many tags or clients they use. The larger the system is, or grows to be in the future, the more money users are forced to spend for software alone. This kills more projects, or forces them into the future, than you could shake a stick at. Systems are never all that they could and should be. Seek out web-based SCADA software that is licensed by the server, not by the tags or clients. Web-based software is installed only once on the server, and unlimited usage is an inherent benefit. You’ve heard the Army slogan “Be all you can be.” Well, let your system be all that it can be by seeking out software that is licensed by the server with no other strings attached. Not having to buy additional licenses fuels innovation. Just think of it, the more eyes on that data the more creative ideas, and with that the company goes into better collaboration and truly attains the advantage over its competitors. This is not mere speculation; it can be observed as fact. Modern IT technology, when utilized by SCADA software, can transform control systems. IT has developed and is using concepts that make data management very fast and efficient: a database-centric, web-based architecture that leverages relational data to its full potential. Gaining a competitive advantage requires investigating any SCADA software vendor to ensure that they can install the software in one place, manage it in one place, add on to it in one place, and have the freedom to use an unlimited amount of tags and clients. Where should you start? When choosing a SCADA software vendor, asking key qualifying questions will help you evaluate how well the software integrates IT concepts. 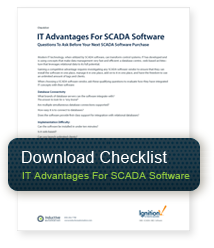 Download the free Checklist: IT Advantages For SCADA Software.